The Office of Professional Development recently hosted its first annual Next Chapter Event to congratulate members of the Class of 2018 on their past achievements and support their future plans. Close to 100 College of Arts and Sciences seniors came to celebrate and participate in the festivities. Students mingled in the Heritage Lounge on the second floor of the Hunsaker building, reminiscing on their favorite memories from Redlands, while eating a variety of finger foods such as fried mac ’n cheese balls, sliced fruit and artisan cheese, tri-tip crostini’s, and mini desserts including cheesecake and chocolate ganache cupcakes. One activity at the event was graduation cap decorating. Seniors enjoyed decorating the caps, and remarked on just how fast graduation was approaching. 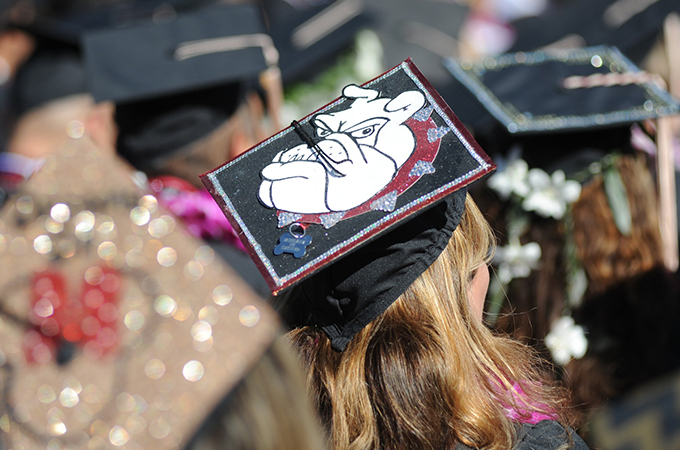 Decorative paper, bedazzling jewels, exuberantly colored paint pens, and stencils all contributed to the creation of the ultimate graduation cap. Students also had the opportunity to take a professional photograph to be used on their LinkedIn profiles and other online media platforms. Seniors at the event add statements to the “Next Chapter Vision Board,” writing about their favorite memories, sharing what their plans are after graduation, and offering advice for incoming first-year students. 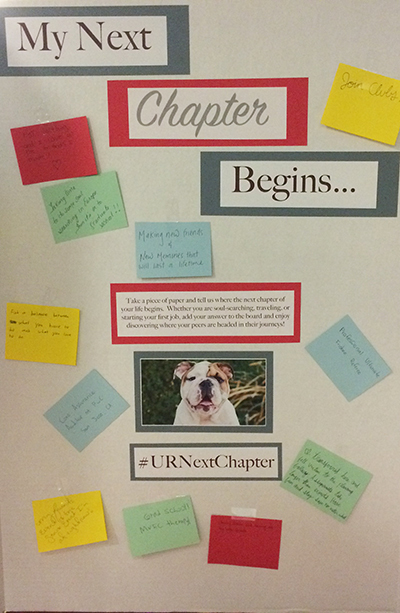 Many of the seniors wrote statements on the “Next Chapter Vision Board,” where they spoke about their favorite memories, shared what their plans were after graduation, and offered advice for incoming first-year students. One interesting piece of advice was “Don’t blink… It goes by all too fast!” This statement rings true for many who reflect on their time as a student at the University of Redlands. Students also said it was important to “Get involved with CSL (Community Service Learning). Find your home in service!” and “Get involved in everything.” This is great advice as it helps to have student employment, volunteer work, and extracurricular involvement to put on your résumé or curriculum vitae (CV) for graduate school or job applications. It is also a fun way to give back to the greater community while making friends. The seniors who attended the event also took the First Destination (Graduation) Survey through Handshake, the University of Redlands’ new campus career management platform. The aggregate data reveals that, while some seniors plan to take time off or are still researching/looking for opportunities, at this juncture 44 percent know they will be working, volunteering, going into the military, or continuing their education. Students will have the opportunity to update their survey responses up to eight months after graduation, providing insight into post-graduate endeavors that we hope will inspire future graduating classes as well as offer valuable information about student success. Overall, the Office of Professional Development would like to say “congratulations” to the Class of 2018! We are so excited for you and what you have planned for your future. As for the Class of 2019, we look forward to having you as seniors next year and seeing you at the second annual Next Chapter Event!